Which ART Path is Right for You? What Is It Like to Be a Surrogate? Best Lawyers, 2016 Best Lawyer in America list. Vice President, American Academy of Adoption Attorneys, 2015-2016. Past Chair and Board of Trustees for the Center for Adoption Support and Education, 2011-2015. Governor Appointee to the Montgomery County Judicial Nominating Commission, 2013-2015. Maryland and District of Columbia Super Lawyer as published by Law & Politics and Baltimore Magazine, 2012-2016. 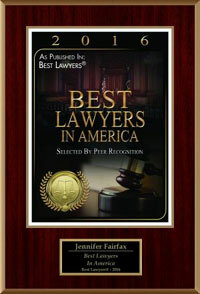 Chosen for her work in adoption, family law and collaborative law. Fellow of the American Academy of Adoption Attorneys. Fellow of the American Academy of Assisted Reproduction Technology Attorneys. 2008 Who's Who Madison as a member of the business community who has demonstrated exemplary achievement and distinguished contributions to her profession. Member of the Reproductive and Genetics Technology Committee of the American Bar Association. Member of the Adoption Committee of the American Bar Association. Professional member of Families for Private Adoption. FPA offers support and education for families interested in private adoptions. Member of the International Academy of Collaborative Professionals (IACP). Family Law Sections of the Bar Association of Montgomery County and the District of Columbia Bar Association, Frederick County Bar Association, Women’s Bar Association, Maryland State Bar Association, Federal Bar Association and the American Bar Association. What should we say to a birth parent? Focus on being yourself. Let the birth parent(s) get to know you and establish a comfort level that works for everyone. Birth parents will have concern and empathy for your situation, and you need to to understand and be compassionate about theirs. You should not be interrogative, ask for personal or confidential information which you personally would be uncomfortable providing, or question medical history.